Bishop Vasa is our Bishop of the Week (again!)! You know you're a Catholic nerd when you and your husband go on one of your very rare lunches out, you bribe the toddler with a small bowl of ice cream and an exciting part of the conversation includes a round of "Who are Your Favorite Bishops!" Me: "I think Bishop Vasa is my favorite. Especially when he stood up to the Catholic hospital's in his diocese. But I like Bishop Olmsted a lot too. And Bishop Sample." Him: "Don't forget about Archbishop Burke." Me: "But I'm talking about in the U.S... Of course he'd be on the list. 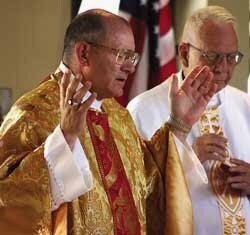 And we're lucky to have Bishop Soto here..."
Every time I read about something Bishop Vasa has done it makes me smile. The article below is just the latest. "The authority of the Catholic bishop within his own diocese trumps the national bishops’ conference and "no bishop has an obligation" to adopt the conference’s documents, asserted Bishop Robert Vasa of Baker, Oregon in a landmark talk last week. "...According to Bishop Vasa, statements from bishops’ conferences necessarily tend to be "flattened" and "vague," allowing certain teachings to "fall by the wayside through what could be called, charitably, a kind of benign pastoral neglect." 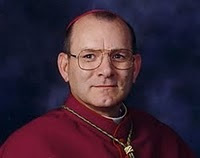 "I fear that there has been such a steady diet of such flattened documents that anything issued by individual bishops that contains some element of strength,” he says, “is readily and roundly condemned or simply dismissed as being out of touch with the conference or in conflict with what other bishops might do..."
Compared to the “flattened documents” that often result from "the search for consensus,” statements from individual bishops, he says, "are often stronger, bolder, more decisive, and thus more likely to be criticized as harsh and insensitive." “Fortunately, courage is contagious,” he notes, pointing to the examples of courage provided by prelates such as Archbishop Raymond Burke, and Bishops Joseph Martino, Thomas Tobin, Thomas Olmsted, and Fabian Bruskewitz. “These men all encourage you, and they encourage me as well,” he says. Both for Bishop Vasa and for you. =) I'm a "fan" of his work as a bishop as well, and both Bishop Vasa and Bishop Olmsted served as assistants at my home parish (LONG ago). Bishop Bruskewitz (the current bishop in my diocese) is fantastic, too, and he brought Archbishop Burke here to speak in our diocese years ago.